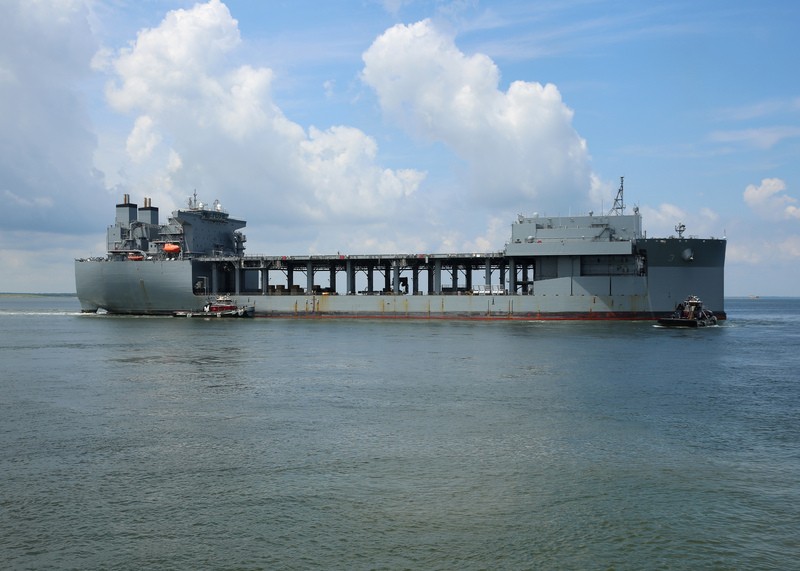 The Expeditionary Transfer Dock (ESD), (Mobile Landing Platform (MLP)) USNS John Glenn (T-ESD-2) is a type of amphibious assault ship being constructed for the United States Navy. ESD ships are to serve as floating bases for amphibious operations, and operate as a transfer point between large ships and small landing craft. U.S. Marines assigned to Marine Medium Tiltrotor Squadron (VMM) 263 and Sailors assigned to the Expeditionary Mobile Base USNS Lewis B. Puller, conduct flight-deck operations aboard the USNS Lewis B. Puller, July 5, 2017. VMM-263 conducted flight certifications aboard USNS Lewis B. Puller prior to deployment.